This Way Ladies is an exclusive women's fitness & wellness center, offering state-of-the-art fitness & cardio equipment. We're not your typical workout place as it was designed with women like you in mind. Call today to visit your neighborhood women's fitness boutique. 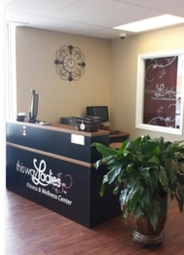 Enjoy a comfortable, invigorating environment where you can exercise in the comfort of other women, just like you. We are not just another St. Louis gym and there's no men to watch you sweat! This Way Ladies has programs and wellness activities designed specifically for women. You can find all the healthy alternatives you've been looking for to help you get back into shape, stay in shape, and give your body the "attention" it deserves. Personal Training Individual, partner, or group training; also available in your home or work place. Boot Camp/ Fit Camp Group classes that help you tone and tighten and increase muscle. Fitness Classes A variety of classes to help you tone, strengthen, and sculpt your body. Massage Various modalities available to take away the tension, relieve stress and ease pain. Facial Deep cleansing, exfoliation, masque, moisturizer, and soothing upper body massage. Far Infrared Sauna Detoxify, relax, lose weight, relieve pain, lower blood pressure. Whole Body Vibration Firm and tone, reduce cellulite, stimulate the lymphatic system. Ladies Day/ Night Out Customize your own event and have the center all to yourselves. Check out our current Specials & Events! Special Offers - Take advantage of amazing TWL special offers! These offers change often, so be sure to check back frequently to find a special deal on our services, fitness offerings, and memberships. Special Events - From time to time, TWL hosts special events that benefit your personal growth and health. Check back often to view upcoming scheduled events.